Rep. Pamela Powers Hannley addressing the Arizona Democratic Progressive Caucus at the May 20, 2017 State Committee Meeting in Tucson. I have been back in Tucson for two weeks now, and it’s been a fun whirlwind of visits, phone calls, and events with Tucson friends and family, LD9 constituents, fellow Unitarian Universalist church members, labor union members, and Progressives. Saturday, May 20 was my first campaign event of the 2018 season– the Arizona Democratic Party’s State Committee Meeting in Tucson. In addition to tabling, I gave Legislative updates to the Arizona Democratic Women’s Federation and to the Arizona Democratic Progressive Caucus. Scott Prior and I co-chaired the Progressive Caucus for three years. This was the first full meeting with the new co-chairs Jenise Porter (Pima County) and Joe Murphy (Maricopa County). Here is my speech to the Progressive Caucus. Everyone says that this session of the Arizona Legislature was “different”. There are several reasons why it was different. For one, Speaker J.D. Mesnard assigned Democratic bills to committees and allowed floor votes on many of them. According to people on both sides of the aisle, he also ran the House much more efficiently than the previous speaker. In my opinion, the real reason that this session was different is that the House Freshman Class is the largest in recent history (or ever). Many House incumbents lost, termed out, retired, or tried to move to the Senate. For House Democrats, this meant a demographic shift with our caucus now being majority Latino, half women, and surprisingly progressive on many policy issues. I’m here to tell you that Progressives– particularly the women– made a difference in the Arizona House this session. I had an existential crisis at about 1 a.m. on November 9, 2016 when I realized that I had won on the same night as that guy. Thanks to Bernie Sanders telling his supporters to vote Progressive down ballot, the Arizona House now has a Progressive wing. And we shook things up. Often, in the past, Democratic Legislators came back to Tucson and said with a shoulder shrug, “What can we do? We’re in the minority.” I found there is a lot you can do. We have our voices, our votes, our strategic thinking, our relationships, and the parliamentary procedures. Using these, the “Feisty Freshmen” women proved to be fierce fighters for ratification of the Equal Rights Amendment (ERA), for fully funding public education, for teacher raises, for extension of the Temporary Assistance to Needy Families (TANF), for restoration of childcare assistance for needy families, for religious freedom (even for non-believers), and for reproductive choice. We fought against multiple corporate tax giveaways, against expansion of private and religious school vouchers (SB1431), against insurance bills that could hurt consumers, and against limiting benefits for workers. In fact, a group of Libertarians and Progressives defeated all of the corporate welfare bills this year; that is up until the last day– when two corporate welfare bills passed thanks to much arm-twisting by the Governor. SB1416 was particularly bad because not only did it give away millions of tax dollars on into the future, it also gave away intellectual property rights for discoveries made by private corporations but funded by the people of Arizona. Progressives and most Democrats stood strong against giving away more corporate tax cuts, but the Libertarians caved and voted with other Republicans and the Governor. People say that a budget is a moral document. Well, the Arizona Legislature passed an immoral document. Instead of spending a little more than $1 million to extend TANF with no strings attached for another year, the Republican Party chose to give an extra $2 million to the Koch Brothers Freedom Schools at the three universities. Instead of giving school teachers a 4% raise, the Republican Party chose to spend $35 million on results-based school funding which will give more money to schools in wealthy districts. Instead of reinstating childcare subsidies for the poor, restoring preventive services for families in crisis, and adequately funding the university system, the community colleges, and the subcontractors who care for our neediest citizens, the Republican Party chose to cut taxes for big corporations. As if trickle down economics actually worked. Arizona has one of the highest populations of children in foster care in the country– close to 20,000 at one point in 2016. The Arizona Legislature created this problem because they cut tens of millions of dollars worth of childcare subsidies and preventive services for families. We are hurting future generations of Arizonans with our stingy policies. The Progressive women in the House used our voices to speak out for teachers, students, families, workers, patients, immigrants… for Arizonans. They tried to shut us up, but it didn’t work. A few of the Feisty Freshmen staged a daily letter-reading protest to keep the heat on the Republicans regarding the private/religious school voucher vote. Everyday, a few of the women would stand up during the point of personal privilege and read a letter from a public school teacher or a parent– sometimes with the person standing there. It was extremely powerful. It kept the pressure on, and it made things uncomfortable for the people who voted “yes” to use taxpayer funds to pay for private and religious education. Electronic Filing HB2280. This bill required several groups or businesses to file state documents online. At the Legislature there has been a big push to put more online and ditch paper. Most of the bill was OK, but it also required state employees to file their personal state income tax online or face disciplinary action or dismissal. I said, “What about the employees?” First of all, that’s a lawsuit waiting to happen because whether or not someone files their personal taxes online or not has nothing to do with their job performance. I proposed an amendment to strike the whole section dealing with state employee section and leave the rest of the bill. The sponsor, Rep. Don Shooter accepted the idea. Fetal Resuscitation SB1367. Well, I wasn’t able to add an amendment to this bad bill, but I wanted to. I think if the state is going to make expensive medical decisions– like keeping alive a non-viable fetus– the state should pay the medical bill for the extreme medical procedures dictated in this bill. Otherwise, the state should stay out of medical decisions. 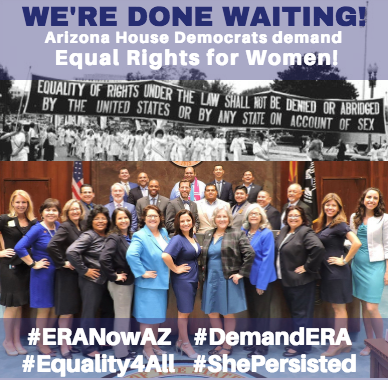 The House Democrats biggest surprise play this session was bringing up a motion to ratify the Equal Rights Amendment (ERA). After Nevada became the 36th state to ratify the ERA, my seatmate Rep. Randy Friese and I put our heads together and strategized parliamentary procedures to bring the ERA up for a vote in the House, where it had never been heard. Friese came up with the nijna parliamentary move to bring it up for a vote, I proposed it, and the entire Democratic Caucus supported it with stories and votes. In the end, it was embarrassing for the Republicans as they stumbled around the issue of women’s equality and equal pay for equal work. Their two primary excuses for shutting down debate on the ERA were: “I didn’t have time to read it” (the ERA is one sentence) and “This should have gone through the normal procedures” (it did but it was stopped by committee chairs). Reporters later swarmed Speaker Mesnard and asked him, “If not now, when” will the ERA get a full debate in the Arizona Legislature? Stay tuned! Progressives– particularly the women– changed the game in the Arizona Legislature this year. They tried to shut us up, but it didn’t work. We used our voices and our votes to speak up for the people– teachers, students, parents, workers, patients– but we need more Progressives and more women in the Legislature to help us carry on this fight. I’m here to tell you that the Progressive message can win in Arizona. And Clean Elections can win. If you are a Progressive and you have considered running for office, do it! Start now for 2018. Check out my news clips here to learn more about the issues and bills mentioned in this blog post. To follow my Powers For The People blog, go here and click on the blue bar that says “Follow Powers For The People”. Blog posts and updates will be delivered to your inbox. 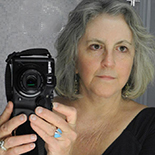 This entry was posted on June 4, 2017 by Pamela Powers Hannley in Arizona Legislature, Austerity, Clean Elections, Democratic Party, education, equality, Pamela Powers Hannley, progressive, Progressive Democrats of America, Trickle Down Economics and tagged Arizona Legislature, capitalism, corporate welfare, Pamela Powers Hannley, Progressive Democrats of America.